Purchase autograph books outside of Disney. Local Orlando CVS, Walgreens, Target or Walmart. Any of those types of store will have Disney notebooks and autograph books for about $4 rather than the $11 at Disney. Plus they will have more pages for autographs. Disney books have 20 pages and some even less because some pages are for photos. Each character takes up a page when they autograph. The Disney books do come with a matching Disney pen. Along with the autograph books, bring your own pens. The parks sell them, but a bit pricy for pens too. I found Disney princess pens at Target, $1 for a pack of 5 lanyard pens. But I also found Disney princess pens at my local Dollar General stores – a pack of 4 four $1. Pack snacks for the kids. You can bring food into the parks, just no glassware. They do search your bags and bag pockets at each park. Bring plenty of snacks for the children (especially if they are little) so you don’t spend all of your budget on snacks and food. Definitely do the fast pass. You don’t want to wait in line more than 30 minutes for a ride. That is wasting your time, unless you are there during super busy days such as holidays. The fast pass is free and cuts your waiting time to 15 minutes or less. However, the fast pass is only offered to those who are staying at the Disney resorts. To get a fast pass, you use your park tickets and go to the fast pass kiosk at certain popular rides. The park maps will let you know which rides have fast passes. The kiosk will give you one fast pass ticket per park ticket with a time slot to come back. If you don’t make it back during that time, you can still use it later in that day. However, you can’t use it before the time noted. And at the bottom of the pass shows you a time when you can pick up another fast pass at another ride. What we did was Nathan would go with the kids to wait in line for a ride that didn’t offer fast pass and I would take all our park tickets to get fast passes for everyone at one of the popular rides. Then meet back up with them. The last time we were there, they were testing a new fast pass system where you can sign up for passes online. Bring things to entertain kids while waiting in line. The hardest time we had with our kids was while we were waiting in line for rides, shows or characters. They had nothing to do, which means the perfect time to act up. We kept them entertained using our smart phones… games and videos. You can also do small travel size games, sing songs, bring travel size books and lots of snacks. Certain little kids rides do not have fast passes and do have long lines. 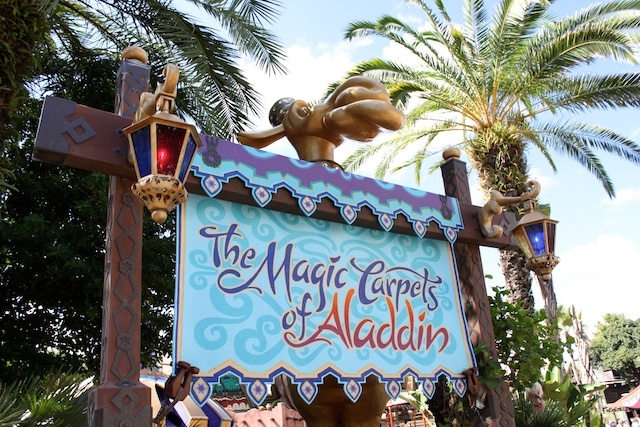 Rides such as Aladdin’s Magic Carpet, Mad Tea Party and TriceraTop Spin. Only because those types of rides don’t have every efficient ways of getting people through the lines. Ask an employee when characters will arrive. If meeting characters is important to you and your children, then you don’t want to wander around the park hoping to bump into them. Popular characters are in multiple parks, some princesses, Mickey and Minnie and Toy Story characters. In the times guide (separate from the park maps) it gives you a general idea where the characters will be and when. It is best to go to the information desk (but there’s usually a long line there) or any street employees to radio in and ask when a specific character will arrive at their meet and greet location. Character meet locations are indicated in the park maps. Epcot is a great place to meet characters. They don’t have all the characters, but quite a few of the important ones and the lines are much shorter because it is not as saturated with children as the other parks. Characters at Epcot are Belle and the Beast, Jasmine and Aladdin, Aurora (Sleeping Beauty), Mulan, Snow White, Mickey and friends, Chip and Dale, Marry Poppins, Alice in Wonderland, Winnie the Pooh and friends and more. 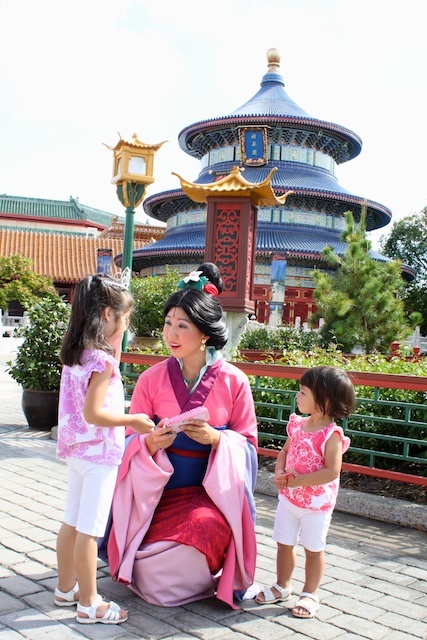 If you want to meet all 9 Disney princesses (like we did), you can find Mulan only at Epcot, Pocahontas only at Animal Kingdom and Tiana (Princess and the Frog) at Magic Kingdom. Buy water. Many people complain about the water in Florida tasting disgusting. It smells and tastes like sea water to me. You can drink it but people don’t prefer the taste, even at the water fountains in the park. What we did was stop by the local Winn-Dixie or Target and purchased 2 1/2 gallons of drinking water for about $3. Each time we are in our hotel room, we filled up our reusable water bottles with it. Get there early. It gets busy around lunch time. In the mornings, one person would grab the fast passes while the other took the kids to the popular rides without fast passes (Mad Tea Party, Aladdin’s Magic Carpet) and meet characters. Those had the longest wait. 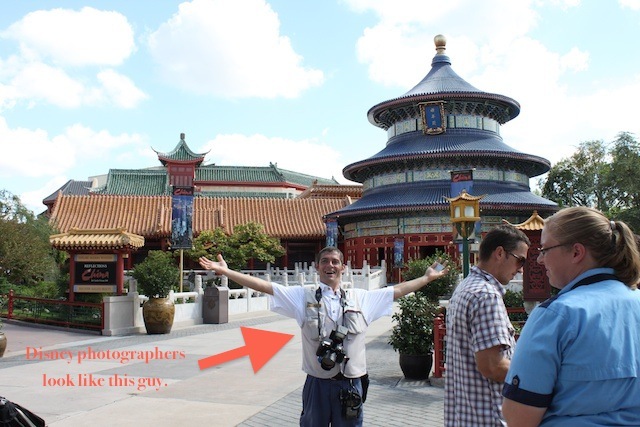 Look for the photographers, if you are concerned about photos from your trip. I had my camera with me and took plenty of pictures. But when I got home, I realized there were only a handful pictures of me on the trip. Being the family photographer, I don’t get in pictures very often. And when I went through my pictures, I realized some of them didn’t turn out as well. Luckily we had the Disney photographer take photos of us just in case. They load it onto a Disney Photopass and you can view the photos they took at the entrances of the parks or online. They photographers are pretty much anywhere that’s a good photo op (entrances, main landmarks and with characters). We ended up having the Disney photographers take over 100 photos of our family on our trip. And they captured moments that I wasn’t able to get. Here’s the best part, they will take photos of your family with your camera too. Not a bad seat in the house for shows. That is as long as your kids aren’t sitting behind a tall person. Other than that, most theaters and stadiums for shows have great stadium seating so everyone can see. So don’t worry about waiting in line 1 1/2 hours early for a good seat in a show, unless you want to sit on the front row. Do get early to the parades and fireworks. You will see Disney employees marking the roads and sidewalks with tape as to where people can stand during parades. Get there early to get a good spot. Or else you will be carrying your kids on your shoulders. The floats are elevated, but some of the characters and dancers are walking and shake hands with some children closest to the front. Another trick is to go toward the end of the parade route. 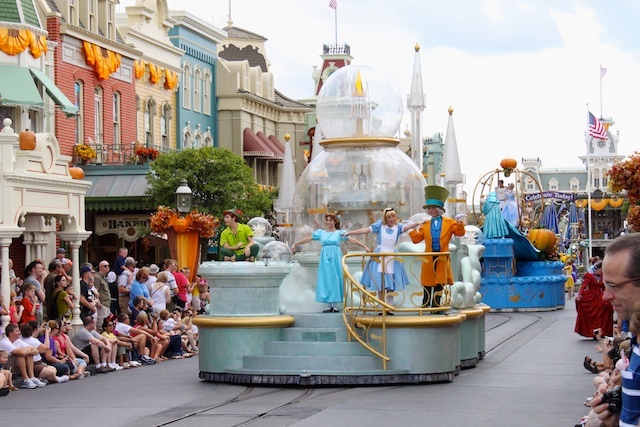 The parade gets to you last, but the crowd is usually not as bad as on Main Street. If you want to attend Fantasia fireworks show at Hollywood Studios, they have limited seating. You have to get there early to wait in line to get in. Some nights they do two shows. However, a sure way to get a seating in the show without waiting in the long lines is to get the Fantasmic! dining package at Mama Melrose’s Ristorante Italiano. Really good Italian food and you get tickets to the Fantasmic! show, guarantee seating and just show up half hour before rather than waiting in line for over an hour. The Fantasmic! dining package doesn’t cost anything extra than your meal. If you have a car, it was faster/easier to drive to the parks than to wait for the Disney bus system to take you to the parks (sometimes). The bus system is free to those staying at Disney resorts. Sometimes you have to transfer buses because it doesn’t take you directly to the park. And to ride the bus, you will need to fold up strollers such. The bus does drop you off at the front of the park (except Magic Kingdom where you still have to take the ferry or the monorail). It was easier for us to drive to the parks that were about 5 minutes away. We had free parking because we were staying on their resorts. We could leave and come back anytime we wanted to the same park the rest of the day. And the parking lots had trams that picked up and dropped off pretty frequently. Remember where you parked. The parking lots are gigantic. They named sections of the parking lots and give each row a number to help you identify where you parked. But you have to remember it. Take a picture with your phone if you have to. You don’t want to walk down each aisle clicking your car alarm. We had to do that once and it wasn’t fun in the hot heat with kids anxious waiting to go back to the hotel. By the way, we weren’t the only ones who forgot where we parked. Each day you can see people wandering the parking lot looking for their car. Know your budget and be aware of the 12 percent tax. Oh yeah. At the Disney World parks they have county tax plus resort tax that comes out to be 12 or 12.5 percent depending on which part of Disney you are in (Disney World is actually in two counties). You will find plenty of things to spend money on at Disney parks. At the parks, people mostly spend money on food and souvenirs. But mostly food, which are actually pretty reasonably priced. We have discovered that the toys and most souvenirs are priced as if you would get it at Target at home. The expensive souvenirs are the hats and some of the Disney Park only merchandises. It’s the tax that gets you. So if you really want to do it cheap, bring your own food. Or the meal plans worked out great for us. 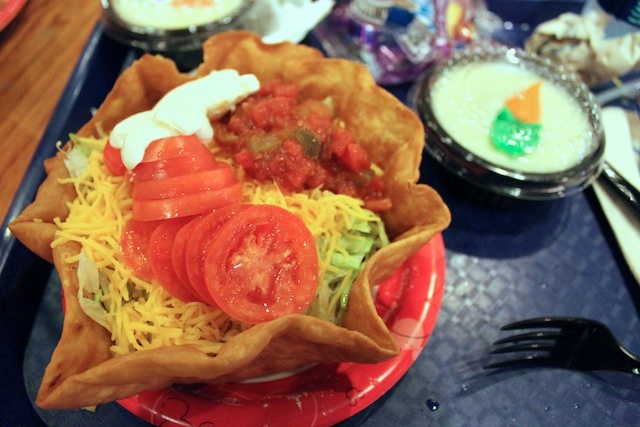 The Disney meal plans are only offered to those who purchase a Disney vacation package (hotel and park passes). You will get more than enough food at each meal with any of the meal plans. Make reservations early. Being Disney World newbies we didn’t realize how serious making reservations was. For character meals and the pirate or princess makeovers you have to book your reservations exactly 180 days in advance for a chance to get the time and location you want. You cannot make reservations more than 180 days in advance. A month and half prior to our vacation we tried to make a breakfast reservation with the princesses at Cinderella’s castle. Ha! No way. They were all booked except one cancelation for dinner at 9:50 p.m. on a Thursday night. Who eats dinner that late?! And since Disney started the dinning plans, you have to make reservations at any and all the nicer restaurants to eat there. So plan ahead. Bring your own stroller. You will need it if you have little kids because on average we walked about 5-6 miles a day per park. To rent strollers from Disney is outrageous. $100 refundable deposit and $15 per day for single or $31 for double strollers. Slight discount when you rent multiple days. Still. We were there 6 days and it would have costed us $162. Could have bought a brand new stroller with that price. And the stroller straps are awesome. We strapped shopping bags, water bottles, diaper bags and my purse to the stroller handles. Made it easier for me to walk the 5-6 miles around the park in the heat. Also, the stroller was nice because our little Elle tends to run off, so strapping her in a stroller prevented her from getting lost. Bring your own ponchos. I’ve heard it rains every so often in Orlando. But it’s not a torrential down pour, usually rains on and off throughout a day. We were prepared for the rain with ponchos and umbrellas. The parks doesn’t close when the rain comes down, only where there is thunder and lightning. And if it’s only raining, it’s actually the perfect time to go because the lines are shortest. But bring your own ponchos because Disney sells theirs for $8 at the parks. Take it at your own pace. Don’t go faster or do more than you or the kids can handle. There’s a lot to do at Disney World and you won’t get to them all. That’s why people keep coming back. So pick out the attractions you and the family would really like to do and keep it to just a handful of rides. 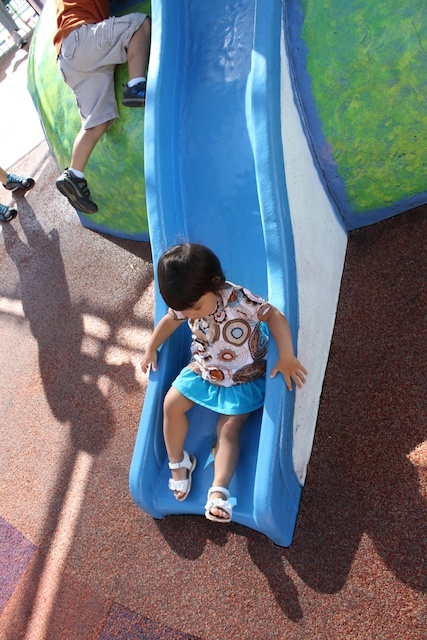 The parks also have fun recreation areas for toddlers with slides and such. That was great for allowing our kids to let loose after a day of waiting in lines. Also, each day we took the afternoon off and spent it resting at the hotel. Then went back to the parks in the evenings for dinner and night attractions. It was nice for us to stay at a Disney resort because it was close to the parks and it wasn’t a hassle for us to go back to the hotel for Elle’s nap time. If your have older kids who can go all day, then it probably doesn’t matter to you how close your hotel is to the parks. 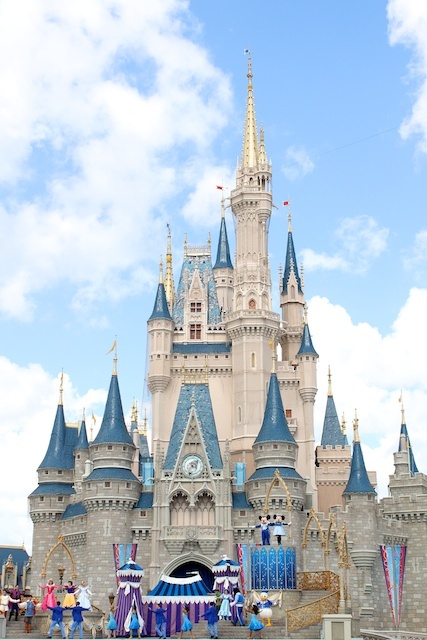 » Tell me… What are your tips for vacationing at Disney World? Great tips, Tiffany! You learn a lot in one trip, huh?! I have a ton of tips–but on the subject of reservations–even if you don’t get in,, keep calling! I called while I was at Disney every day for a certain reservation! And we finally got it! Wait, you didn’t mention Parent Swap. Please tell me you did this so you could ride Splash Mountain, Big Thunder Mountain, etc. It was great for us. The 4yr old got to ride twice (once with mom, once with dad) and we only had to stand in line or fastpass once. We spent a whole naptime (for then 18m old) switching off those two rides in Frontierland. She didn’t even know what she was missing, plus her favorite little kiddie play area was just under splash mountain. Glad to hear you had such a great time. We loved taking Dinsney transportation when we were there. They drop you off right at the enterence. They do ask if you have a stroller to collapse it. With that in mind a umbrella stroller is the best route to go. We did a regular size stroller on our first visit and it was cumbersome when it came to this. We took a backpack with us instead of a traditional diaper bag. It was so much easier to carry. The dining plan offers more than enough to eat … no joke! We had one sit down, one quick and one snack. Never did we eat our snacks. Instead we saved them to purchase Minnie’s cookies to take home. They do have baby stations located in each of the parks. These are great for diaper changes and breastfeeding. They include tv with cartoon, ac, water and any baby needs you may have forgotten. Rider switch was great. Our first trip we had a 6 month old and a 11 year old. Our 11 year old got to go on the rides twice while we went on once each. We plan on going again in summer 2011. 1. The best place to watch the parades is in Frontierland. Stand in front of Country Bear Jamboree or in that area. Much fewer people there! 2. The best time to ride Splash Mountain is during the afternoon parade…around 3pm. We have done this often, and sometimes you can walk straight through – no line at all! We brought a big pack of colored pipe cleaners for entertainment in the long lines. When we got to the front of the line, the kids would either throw away the pipe cleaners they had been playing with or pass them back to another kid in line. For $2, you get 100 in a pack! Right when you enter the parks, there is an area with free special occasion buttons, i.e. First Time at Disney, Birthday, Anniversary, Family Reunion ect. I got a First Time Visitor button for my daughter, and all week the Disney employees would congratulate her and ask her how she was enjoying her first trip to Disney. She loved the attention. The birthday buttons were given to my husband and mother, who share a birthday and happened to be celebrating at Disney, were spotted several times by employees who either wished them a happy day, or sang. It was a lot of fun to watch! I am a native Orlando Floridian. 🙂 Our saying is, If you don’t like the weather wait 15 minutes. That is about how fast some of the storms pass through. I worked for Disney World when I was a teenager, many moons ago. I would like to say the biggest mistake I see tourists make is not wearing sun block. When I worked there I would mention to people, especially ones with kids, how important it is and even more when it is cloudy. I know that sounds weird but I worked in the resorts and the main park and I always saw the typical tourist burn, remember to reapply ever 2-3 hours when you sweat. Also, skip the sugary drinks and stick to just water, we sweat a lot in Florida. 🙂 I love Disney World, it brings out the kid in all of us. Great tips- we always head to the back of the park right away- skip Main Street and come back to it. Everyone takes their time there, this way you can get to some of the rides before the crowd. Also, the left line in many cases is shorter than the right. We tend to be a right handed society so people migrate to the right. Early in the morning you can typically meet a lot of characters right inside the gate. If you don’t care about the parades that is a great time to hit some of the popular rides. The comment about the parent swap is a great one-you all just wait in line and when you get to the front you tell them that you want to do that and they set you up. It is great. Every morning, I took a picture of what my son in the hotel room. He never did wander off, but I liked knowing that – just in case – I could easily scroll back on my camera and show exactly what clothes he was wearing. We did the bus system, but I’m also a fan of taking a picture of the sign where you park. No wondering if it was Mickey 37 or Minnie 73 at the end of the day. Use the early morning magic hours! We were up that early anyways (what toddler sleeps in?). We grabbed a to go meal (muffin and a water) and ate it in the holding area of the park. My son loved the pre-opening entertainment and we were able to get in at least 2-3 rides and a fast pass in the first hour. Do what works for your family. My son fell in love with It’s a Small World. I hadn’t planned on riding it 5 times, but we did. Disney is about having fun. No need to get in every ride. My favorite tip with little kids was to write our phone numbers in sharpie on their upper arms. it was mostly covered by the t-shirt all day, but if they got separated from us, they could point to the number and ask someone to call us. I would also second the reminder to re-apply sunblock and wear some light colored hats. It goes a long way to keeping the whole week enjoyable! Thanks for the tips! I’m looking forward to going and this will be a big help. We loved the Photopass option on our trip to Disney World and gladly paid the $150 for the over 200 photos taken of our family on the trip. The best part was that all five of us were in a whole bunch of them and we never had to lend our camera to someone who might run away with it! We went with a teenager and pre-teens and when we go again, we’ll be booking a longer holiday, so that we can take some rest days in between days at the parks. We were go, go, go from 8am to 11pm every day for a week and were absolutely exhausted by the time we got home. Next time we’ll space it out as the multi-day passes can be used over (I think) a 14 day timespan. I want to see more of Orlando on our next trip. On strollers, don’t take your most expensive, fancy stroller, and don’t load it up with things you don’t want to leave behind. You will have to leave it in the stroller parking for several rides and shows, so also be prepared to carry your baby if that’s who’s in there. How do I sign up for the pirate makeover for my grandson and also the photographer? My daughter , myself and my grandson are going to WDW right after Memorial weekend. I don’t even have kids and I found this extremely helpful. Thanks so much! I had no idea the photographers will take pictures with your camera too, that’s really good to know. Linda, it’s called the Pirate’s league and you must call disney to make a reservation. You must be 3 or older. We did it last year with our three boys and we are doing it this year with them and our daughter too. We did the basic package $30 and they take a photo afterwards and it was $15. It was a wonderful experience. Can’t wait to do it again. I, myself, have been to Walt Disney World 10 times. Here’s some info that I’ve found to be very helpful! If you’re planning on going to 3 or all 4 of the parks, the BEST for your money and experience is to get the Park Hopper tickets! Depending on how old your children are, there are some parks that you could probably get done with pretty early, especially if you get there at park opening, use Fast Passes, and hit the popular attractions early on. Such as Disney Studios. THEN, there’s Magic Kingdom and Epcot that take a lot longer because there’s SO much to see and do. By getting Park Hoppers, if you finish early with one park, you can just hop on a bus (or get in your car) and go right over to a park that you needed more time in. It let’s you take better advantage of your time. We use to opt out of the Park Hoppers because they’re a little more expensive, but once we tried them, we haven’t gone back! It gives you more options if you missed out on some rides or shows before! Also, if you can stay at a WDW resort, I highly recommend it. You will have such a greater experience.. the full DISNEY experience if you do. They have about 20 different resorts to choose from, all with really cool themes. You can pick between the value, moderate, deluxe, and then those expensive villas. TOO pricey for me! But just look on the Disney websites for details to figure out what’s best for your family and your wallet. But MY personal fave… Port Orleans-French Quarter. It’s one of the moderate resorts. Still kid friendly with fun pool areas and playgrounds, but so beautiful with a look and feel that an adult would definitely enjoy! Also, there’s a river that runs behind the resort where you can take a boat to the connected Port Orleans Riverside Resort AND to Downtown Disney. Another AWESOME place! One more thing… one of my fave restaurants is the Rainforest Cafe. I guarantee you kid will LOVE this place & it’s not crazy expensive! There’s one in Downtown Disney & one at the Animal Kingdom. Hollywood studios had different characters and the lines were so so short (2 min or less). The boys walked up to jake, handy manny, buzz, woody, and the toy soldier… Great fun without the wait. Animal kingdom had a great parade, the safari was fabulous and the shows were good but there were minimal rides. I should have reviewed the park and made this day a half day with Hollywood studios. Animal kingdom has the best character breakfast! Chef Mickey was good at the contemporary but not as great! The dumbo ride was a must-do for my boys, be careful in the waiting area for the dumbo ride. Rather than waiting in a line, u receive pagers when it is time for u to ride and the kids play in a play area while waiting. My son was so excited to climb to the top of the firehouse, but once he got there he was stuck there. Unfortunately there are SO many children moving thru that he could not make his way back to the hole to climb out. He got upset and started to cry. Fortunately a 7 yr old boy sat with him until I got him out. Truly chaotic! Disney recognizes good deeds, I reported the good deed of the 7 yr old boy mentioned above and his whole family was treated to ice cream. We did not do this, but met a family who did… There is a company who rents single and double jogger strollers in Orlando. They will deliver and pick up from your hotel. They are very nice strollers and 40-60$ for a week. Worth the savings and convenience of having it in and out of the parks. Love that the good deed was recognized!! I love that Disney recognized that boy and his family! Love all your mommy tips! We are planning a Disney Trip and this was very useful! Also the fast pass is available for everyone. We have always stayed off Disney property since we have a large family and we learned renting a house works best for us and we get to enjoy the fast pass feature too:) Also I recommend the big chunky pens for Mickey and his friends since it makes it easier to wrap there hand around. Also the smucker sandwiches they serve are so much cheaper if you pick up a box outside of Disney World and just bring them with you. We went through several boxes of them while we were there! Since we stayed off property we did not get to use the extra magic hours but I have learned that if a park is open to 1:00 am then the following morning the crowds will be hitting a different park. We were able to enjoy the park that away with alot smaller crowd! There is so much disney snacks, toys, etc available that by the time we left for our last trip I had a stock pile of things for my kids that I bought all year long and this cutdown on them wanting alot throughout the parks! My kids enjoyed all the FREE activities through out the parks such as the camp fire with Chip & Dale at Fort Wderness, the Jedi training at Hollywood and visiting Epcot and recieving there stamp from each Country. We our going back this Novemver to celebrate our daughters 5th birthday and we are staying at Fort Wilderness in our rv. So excited to experience staying on property this time! Any park guest can use FASTPASS. You do NOT have to have any special tickets or be staying at a Disney resort hotel. 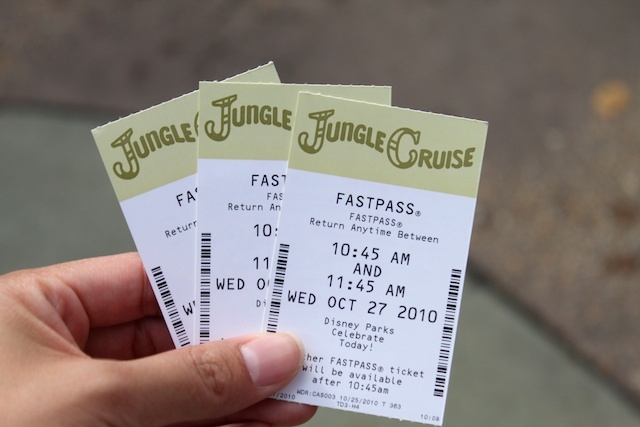 FASTPASS is available to EVERYONE without an additional fee. The Disney buses do park in front of the Magic Kingdom and do not require you to take a monorail or ferry once you are dropped off. My family has been to Disney around 15 times and I think we’ve finally got the hang of it. All these tips are wonderful! -reservations. Now a days if you are a Disney member you can make them online. Once you’ve got one done there’s no stopping because (surprisingly) it’s really addicting. I suggest doing this about 3-4 weeks before your trip since the spots are limited. Some great resturaunts: liberty tree, the one in the Mexico area that is not Hacienda (sorry! Can’t think of the name), and the Japanese (be sure to get the one where they make the food in front of you). -rest. We normally do half our trip on the beach, half at Disney, but if you are just going to Orlando be sure to plan at least one day in the middle of the trip because the whole family will be pooped out by the end of the day. -Finding your kid. what I normally do for my kids is write on a little slip of paper my phone and my husbands. When they were 3-6 years old I sewed it on the back of their shirts since I know they can easily drop a paper. Also if you have multiple kids I recommend having them wear bright and matching shirts so you can easily see them in a crowd. Before you leave the park (please!) go over what to do if they get lost. -check the weather! We normally plan on going to Animal Kingdom on the rainy days since its, well, like living as an animal. Bring ponchos, rain jackets, and stroller covers because sometimes it can get pretty intense. Also bring little hand towels because after a shower all the seats will be pretty wet. -magic hours. They are life savers. They are available to those who stay at a Disney hotel only and you have to have your room key present. This is the when you get to go on all the rides that have long lines and have a much shorter line to wait in. -snacks. Now when my kids are teenagers they still ask for any food that I have. They do check your bags so be careful. My personal handy favorites: goldfish, kettle corn, saltines, wheat thins, prezels, Cheerios, Welches fruit snacks, and Milanos. I have a Buffet style snack table before we leave and I let my kids pick what they want for snacks on the trip. Then the night before we go to the park I let them choose what they think they will need for the day and it all gos into a pocket in my backpack. -sun. It is very hot in Disneyland so we normally pack at least 1 tube of spf30 sunscreen and we each have a pair of sunglasses. I hope this all is helpful! I will add more soon because I am sure I forgot a lot! Don’t forget to have fun with your kids because after all, it’s DISNEY!